As previously reported (here), the collection of African art of Richard Scheller (a leading biochemist and an executive vice-president at the biotech corporation Genentech) is currently on view at the de Young museum. The exhibition catalogue features an interesting essay about DNA analysis (pp. 288-289): a number of objects of Scheller’s collection has been tested to identify the species of tree used to create the works. The goal was to develop a process that could be used to authenticate pieces and to provide scholars with more information about their creation. “There is a constant issue around authenticity in African art, if the species of tree didn’t grow on the continent of Africa, then you might wonder if your object was authentic or not”, Scheller said to The Art Newspaper. Working first with modern objects, Scheller and his team at Genentech, which funded the research, discovered that they could chemically extract and sequence DNA from dead wood. By comparing it with a public database of chloroplast (organelles found in plant cells) DNA, they were able to identify the species of tree. They then turned to the works in Scheller’s collection, removing just enough sawdust from the bottom of three sculptures to repeat the process used with the newer wood. The results were extraordinary: the team was able to extract DNA that was 100 to 200 years old, proving that it could still be found in materials that had been dead for many years. This was probably the first time that this process has been applied to a work of art made from wood. Finding a species DNA match in the database presented a challenge, however. “When we made the DNA from the art objects, we found that we were only able to establish distant relatives,” Scheller says. “There are 300,000 species of plants on earth and only around 400 have been deposited in the database so far.” The team was unable to find exact species matches for any of the works, but a Jonga sculpture from the Democratic Republic of Congo returned the highest number of database matches; these pointed to the Madagascar rosy periwinkle, many species in this family can be found in Central Africa. The nearest relatives identified in the other two works, although more distant, were also from families of trees commonly found in Africa. For Scheller, the process was a success. “That it’s possible to do this is the question that we were asking,” he says. “It is possible to take wood, make DNA and determine the species.” Although the database needs to expand before this process can be fully utilized. Once the database catches up, the possibilities for research are endless. “In ten years, this could become a very powerful tool,” says Lesley Bone (chief curator at the De Young), who believes that it holds the promise of great discoveries for curators, from establishing material trade routes to understanding how materials shifted with tribal migration. Scheller agrees, citing reports of tribes that created certain sacred objects using particular species of trees. Comparing the DNA of these objects would make it possible to determine if they came from the same species, so confirming their shared provenance. Obviously, this is a very interesting scientific development – stimulated by somebody who has the technology at his disposal; kudos to him. But, as Scheller correctly states, it is all a bit ‘too new’. Without a database containing the DNA of all trees that grow in Africa, the technique is not very helpful (yet). Even if DNA analysis would find out the species of wood that was used for making a specific object, it would tell us not much about its authenticity – except, in a negative way, if the wood did not exist in the area the object is reportedly from. Furthermore, specialists at the Belgian Royal Museum for Central Africa are already able to identify Congolese wood species. They are, however, impossible to consult as a private researcher. But, as is noted in the catalogue, the tremendous biodiversity in Africa can make distinguishing specific species rather difficult (reference is made to the approximately 1,300 species in the Acacia genus). Personally, I think, for now, connoisseurship will remain the first and foremost way to appraise African art, although science will definitely come to play a more important role in the not so far future (an example here). This entry was posted in Opinions, Research on March 31, 2015 by admin. Last weekend, the Museum of Cultures – MUDEC opened its spaces with two exhibitions: “Worlds in Milan” and “Africa”. The museum, designed by the British architect David Chipperfield, is a joint venture with the city of Milan overseeing the museum’s permanent collection, whilst a private company is in control of the institution’s commercial enterprises, education programme and the organisation of two annual temporary exhibitions (read more about it in a previous blog post here). The Ethnographic Collections of the Municipality of Milan bring together more than 700 works of art, textiles, and tools from all continents; a collection that will be already on view to visitors in the storerooms of the MUDEC after the inauguration of the show thanks to guided tours. In the autumn, once the two first exhibitions are over, a selection from the collections will be set up in the exhibition halls of the museum. Read more about it here. “Africa. 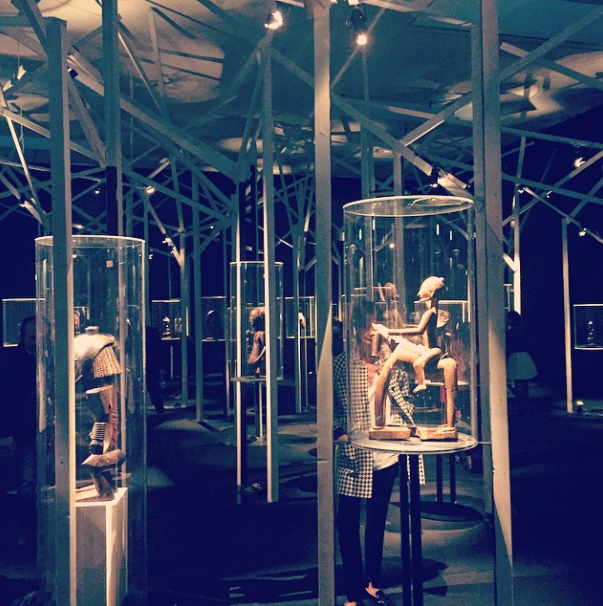 The land of the spirits” (27 March – 30 August 2015) is a monumental show dedicated to the art of Africa from Medieval times to the present. With more than 200 items a pathway is offered of works of the cultural and religious tradition of the African continent that runs alongside the masterpieces known to western culture for their aesthetic value, explaining the symbolism and the importance in daily life of the peoples of darkest Africa. Through the halls of the show it will also therefore be possible to discover that African art, wrongly defined as “primitive”, begins life in reality from an idea and formal traditions that are very precise, in a manner that is not very different from what occurs in the ateliers of western artists and the fact that the so-called savages produced art that could speak to the great masters of the avant-garde and so change the history of western art, and that African art had actually been known and sought after for centuries and formed part of the collections of the greatest European courts. The works on show are then re-read within the culture of Africa of life, death, respect for ancestors and divination, explaining that through artistic artefacts the spirits of the earth and the wind are questioned and it is sought to placate the ineffable demons that threaten the life of men and animals. ps you can find snapshots of the exhibition installation searching with #mudec on Instagram here. UPDATE: a short video review of Africa can be found here. This entry was posted in Museums, News on March 30, 2015 by admin. Over the course of his long career, Picasso devoted himself to sculpture wholeheartedly, if episodically, using both traditional and unconventional materials and techniques. Unlike painting, in which he was formally trained and through which he made his living, sculpture occupied a uniquely personal and experimental status in Picasso’s oeuvre. He approached the medium with the freedom of an autodidact, ready to break all rules. This attitude led him to develop a deep fondness for his sculptures, to which the many photographs of his studios and homes bear witness. Treating them almost as members of his household, he cherished their company and enjoyed recreating them in a variety of materials and situations. Picasso kept the majority of them in his private possession during his lifetime. It was only in 1966, through the large Paris retrospective Hommage à Picasso, that the public became fully aware of this side of his oeuvre. 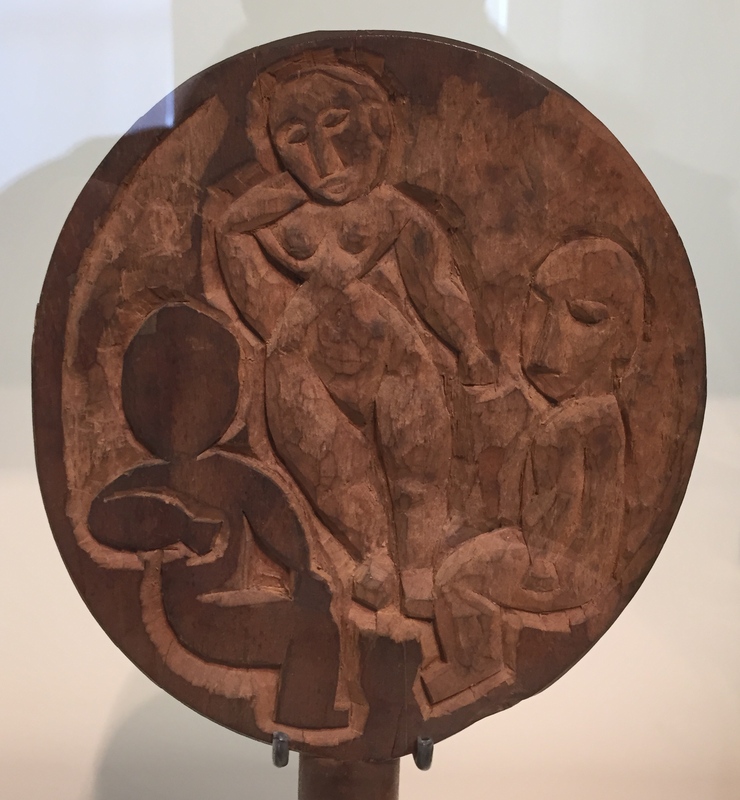 Following that exhibition, in 1967 MoMA presented The Sculpture of Picasso, which remains the first and last exhibition on this continent to survey the artist’s sculptures. Picasso Sculpture will be installed throughout the entire fourth floor of MoMA’s galleries, allowing sufficient space for the sculptures to be viewed fully in the round. The exhibition will include a selection of relevant works on paper and about 30 of the remarkable photographs of Picasso’s sculptures taken by Brassaï. Picasso Sculpture is organized in chapters corresponding to the distinct periods during which the artist devoted himself to sculpture, each time exploring with fresh intensity the modern possibilities of this ancient art form. The exhibition focuses on the artist’s lifelong engagement with this genre from the point of view of materials and processes. The aim is to advance the understanding of what sculpture was for Picasso, and of how he revolutionized its history through a lifelong commitment to constant reinvention. Although this show will not travel, the Picasso Museum is presenting a smaller version of the exhibition in spring 2016. And, Laurent Le Bon, the director of the Musée Picasso, recently revealed that he is preparing an exhibition with the Quai Branly Museum on Picasso and Primitivism (source). Now that’s something to look forward to! This entry was posted in Exhibtions, Museums, News on March 29, 2015 by admin. In accordance with the vision of the Board of Trustees, Gavin will oversee the development of infrastructure and programming in support of a mission that spans culture, business and policy. Gavin’s team will develop and curate a wide range of artistic exhibitions and events, foster a transformational and international enterprise network and develop a Policy Center that will serve as a new Africa-focused think tank. Altogether, The Africa Center aims to transform the international understanding of Africa, the world’s oldest continent with its youngest population, and to promote direct engagement between African artists, business leaders and civil society and their counterparts from the United States and beyond. Before joining The Africa Center, Gavin served as United States Ambassador to Botswana from June 2011 to March 2013, after having spend a decade in International Affairs (with a focus on Africa). Her appointment will hopefully speed up the opening of the Center (whose launch has already been postponed six times). As said in a previous blog post, the old museum will only be a small part of a new hybrid organization (“part cultural outpost, part public policy institute and part international business forum”). 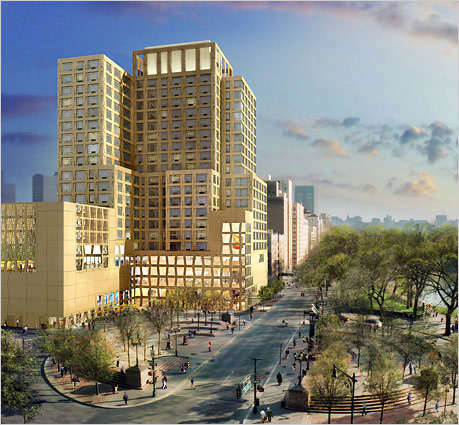 As the New York Times states, this job will certainly give Gavin a chance to show her diplomatic skills while developing this reinvented institution – read the full article here. So, what about the African Art? The Museum for African Art’s collection consists of about 550 objects from Africa or the African diaspora, including a bronze Benin head, carved wood figures, and masks and paintings by the Sudanese artist Ibrahim El-Salahi. This entry was posted in Museums, News on March 26, 2015 by admin. The ‘nkishi’ is about two feet six inches high. A wooden figure covered with charms, etc. It is carried about by two women, who may not touch its sacred person, but hold it by two long poles attached to its arms. Moreover as it is carried, a drum and rattle band is in attendance, while little girls sweep the ground before it, as it stood upright, with grass cloth bundles filled with magic charms. 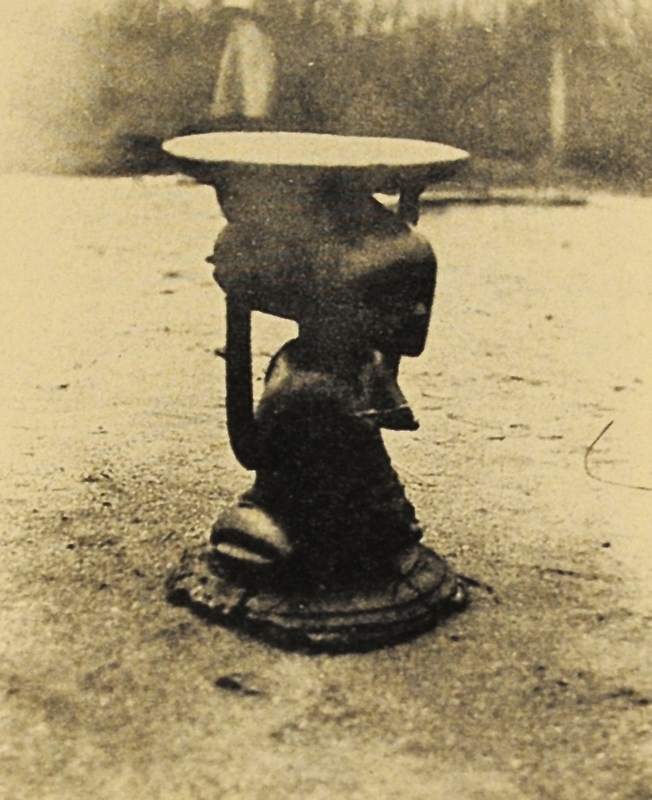 The father of a certain native Songye, was lost, and the idol was paid a big sum to find him. The poor tired woman attendants dragged it uphill and down dale, through stream and forest, now and again professing to get on the scent, but in vain. I knew the functions of these power statues were varied, but I had never read they were also used to find missing persons. What is especially noteworthy about this description is the fact that the statue couldn’t be touched and was carried by long poles attached to its arms – a known fact. This explains why you will see the connoisseur evaluating a Songye power figure looking at the arm pits of the statue: a well used authentic example will show a notable wear caused by the ropes connecting the poles to the figure under the arms. 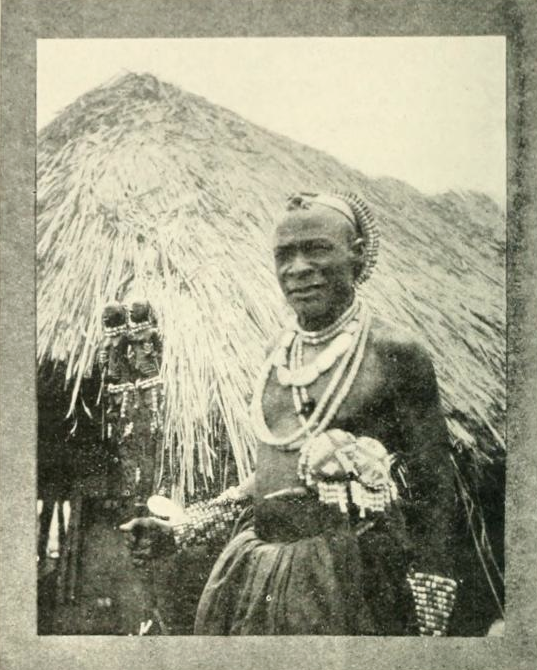 Unfortunately, I wasn’t not able to discover the current location of Tombwe – it is even not sure if he ever left Kabashilange..
ps you can browse (or download) that 1922 Burton book here – there’s plenty more to discover! This entry was posted in Objects, Research and tagged Field-photo, Songye on March 17, 2015 by admin. The Barbier-Mueller Museum invited the anthropologist Nigel Barley, a former curator at the British Museum, to take a look at the museum’s Nigerian collection, which came into being over more than a hundred years, thanks to the personal and informed “eye” of the collectors Josef Mueller and Jean Paul Barbier-Mueller. Without aspiring to cover exhaustively the cultural production of Nigeria across the two millennia of its history, the Barbier-Mueller collection is very rich in several respects. Faithful to chronological continuity, it provides a sample of the production of the major cultural centers of Nigeria, shedding light on archaeological pieces from Nok, Katsina, and Sokoto, works from Ife and the kingdom of Benin, and Yoruba, Ijo, and Igbo objects, as well as items from the Cross River and the Benue Valley. 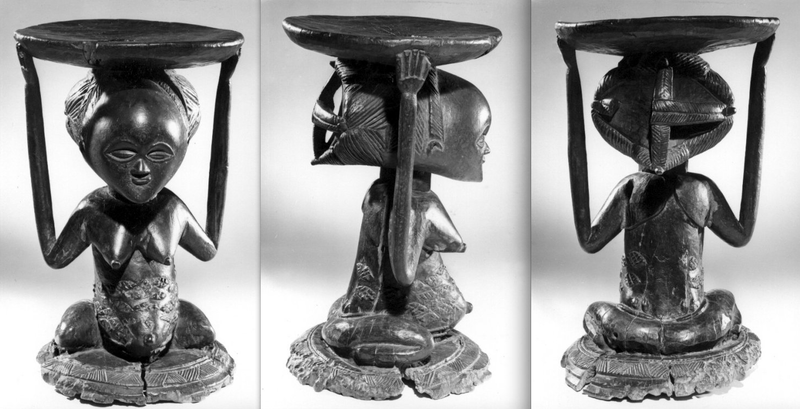 By virtue of their rarity, certain pieces in the collection constitute “monuments” of African art. Others, by their emblematic force, are among its great “classics”. The exhibition sets out to present these objects, including several displayed here for the first time, highlighting their aesthetic quality even while explaining, by means of the catalogue, the ethnographic context of their production and use. Nigel Barley provides new angles of approach for considering, understanding, and perhaps even better appreciating the art of Nigeria. 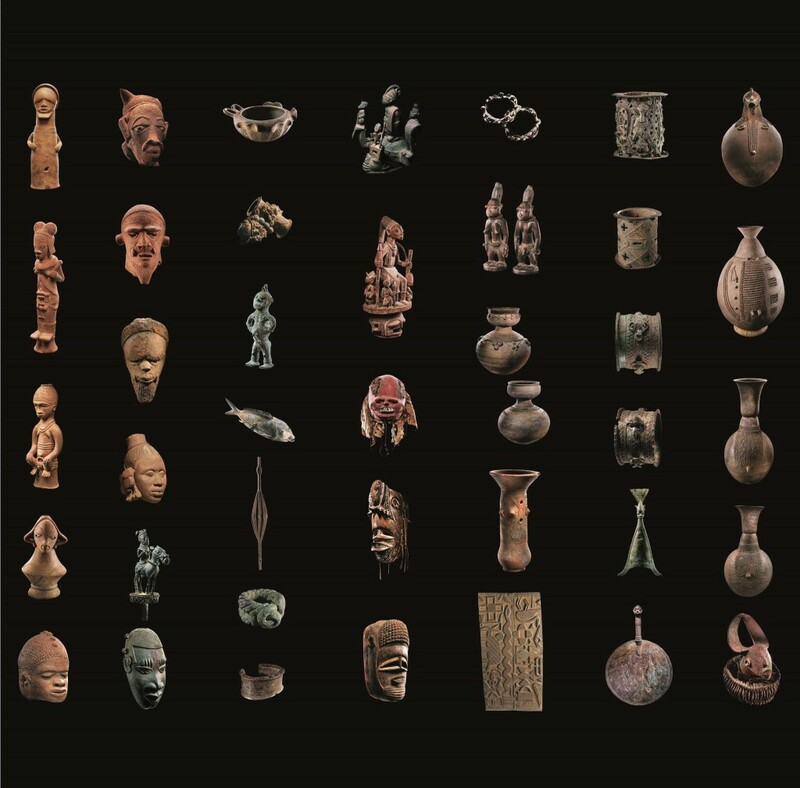 The subject of the show is interesting since Jean Paul Barbier and Monique Barbier-Mueller sold a substantial part of their Nigerian collection to the Musée national des arts d’Afrique et d’Océanie (now part of the Musée de quai Branly) in 1996 and 1997 – you can browse 242 objects of the 262 objects here. This exhibition will thus show objects that were not included in those sales or acquired since then. This entry was posted in Exhibtions, Museums on March 11, 2015 by admin. For my private collection, I’m looking for so-called “snuff rings” from the Tiv of Nigeria. If you come across one don’t hesitate to contact me. The designation “ring” in fact is problematic since not all of them can actually be worn as a ring. Two of mine can be worn around a (thin) finger, so it’s obvious the others were held in another way. “Snuff-inhaler” or “snuff-taker” seem better names. So far, I’ve come across two theories about their use: 1. they are made to hold a pinch of tobacco snuff to the nose for inhaling, or 2. the Tiv use them to close one nostril while sniffing powdered tobacco up the other nostril. 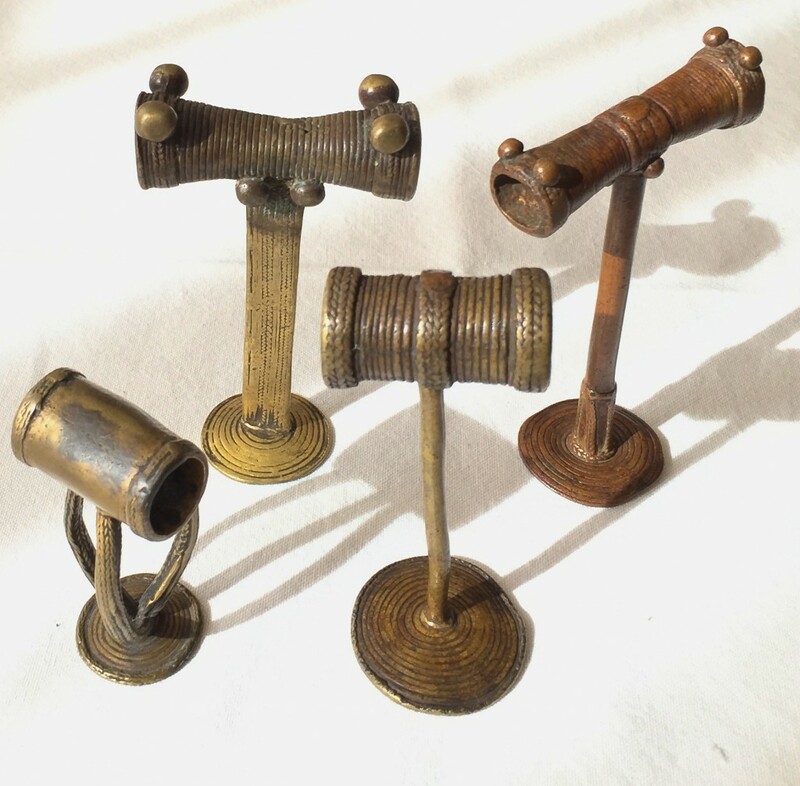 These were cast in brass in the “lost-wax” method. Fagg has stated in an old Christie’s catalogue that the Tiv used latex instead of wax. The “T”-shaped form, of which I have three examples, is the most common. The stem rises from the tubular base and ends in a circular platter embossed with concentric circles on both sides. All of them are decorated with fine banding motifs (always on the tube and often on the stem). In two cases we find 8 small balls on the tube: 2 x 2 at the outer edges and 4 around the stem at its connection with the tube. Clearly there must have been symbolism behind them; the four elements (earth, wind, fire, and water) have been suggested. While I possess four simple examples, snuff-takers featuring anthropomorphic elements also exist; the British Museum even holds an example featuring a horse-and-rider (Af1954,23.1114). I could only find one reference to them in the literature. François Neyt discusses them in his 1985 book The Arts of Benue (p. 200, photo IV.45). According to him, they relate to the “identity of the chiefs” or are “instruments of witchcraft”. In secular practices, these rings (while supported by the right and left index fingers of both hands simultaneously) were used to “sniff snuff” as was witnessed by the public and colonial magistrates. For religious purposes, “hallucinogenics” where “sniffed” to transport the initiate to the spiritual realms. I would love to find more about them, so please get in touch in case you would have more information about their use, function and symbolism; or know a reference to them in the literature. As can be seen on the photo below, a curious detail is the difference in usage patina on the top of the platter: two of the four are so worn (by an unknown kind of use) the concentric decoration has totally disappeared. This entry was posted in Objects, Research and tagged Tiv on March 11, 2015 by admin. 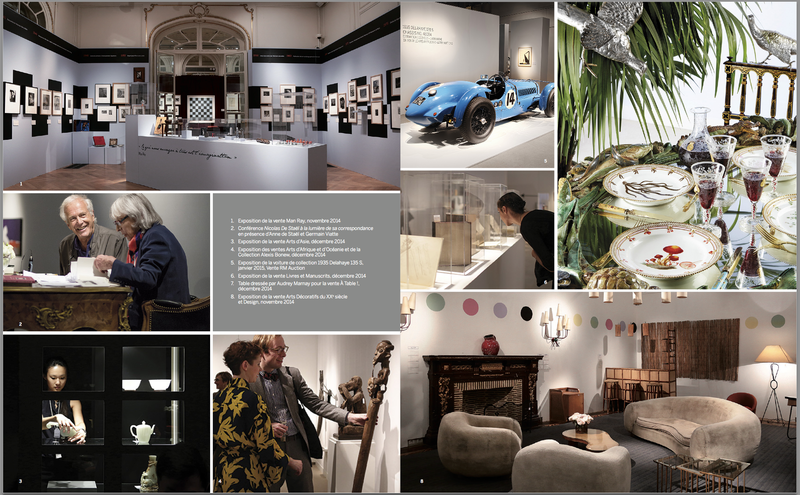 A reader informed me a photo of yours truly was published in the latest issue of Sotheby’s Paris’ magazine Faubourg 76. I was just explaining the missus how I thought that that Bangwa figure was holding a severed head and not a mask, as was suggested in the catalogue here. When you held the pole back, as I was doing on the photo, you looked straight in the head’s dead gaze. 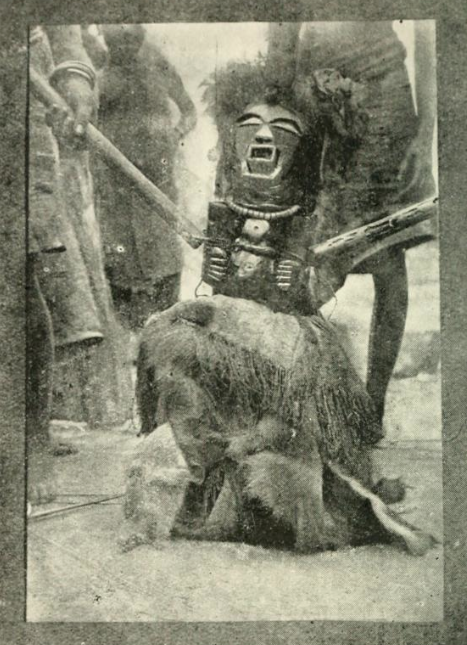 Presenting a severed head has always been a strong and awe-inspiring image. This entry was posted in News on March 10, 2015 by admin.